Foundation-supported research led the trustees to understand that subsidies can have a beneficial effect, such as helping property owners move out of flooded areas, or to incentivize development of new, clean-energy technology. However, once subsidies are in place, they often outlive their usefulness and end up supporting established industries that fight their removal. 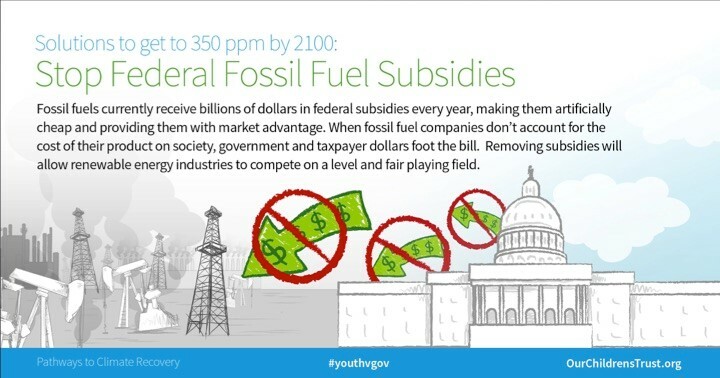 Subsidies have long made fossil fuels artificially cheap, giving them an unfair market advantage compared to clean energy. Clean energy subsidies are needed to jump start the industry. Some of the Foundation’s first grants supported eliminating subsidies that have outlived their usefulness. Current grants support a revival of cleanenergy research and discontinuing fossil fuel subsidies. Climate scientists warn that unless we act soon, continuing emissions will trigger positive feedback mechanisms, including disintegrating ice sheets, release of frozen methane deposits, and release of carbon dioxide from thawing permafrost. Once triggered, these feedbacks will accelerate warming, resulting in economically-damaging increases in temperature and ocean acidification so severe that the economy will not be able to afford adaptation. The 2018 U.N. Intergovernmental Panel on Climate Change (IPCC) reports that emissions will need to be reduced right away, and stopped completely by 2050, to avoid a climate catastrophe. The longer the delay, the higher the cost will be. 1 However, the IPCC tends to be conservative in its timeline for emissions reduction because, although the group relies on science, public statements are the result of negotiation with governments over the precise language. It is urgent that we act now. 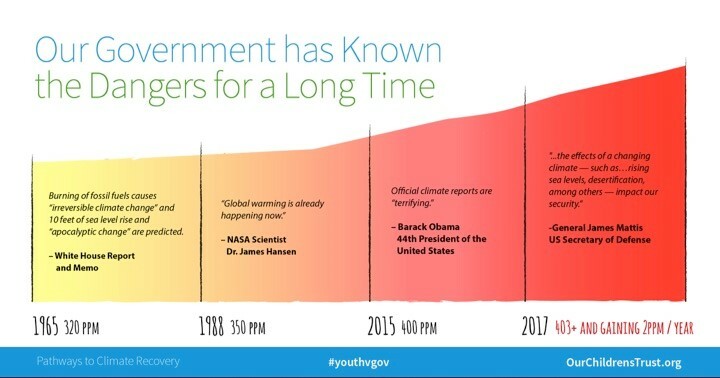 Our government has known that fossil fuel emissions are causing global warming for a long time and affirmatively acted to exacerbate the climate crisis. By permitting and subsidizing fossil fuel extraction on federal land, the government has accelerated the climate crisis. Because of the dominant role fossil fuels have come to play in the economy, asking politicians and voters to address a problem today, when the costs of inaction are mainly borne by children and succeeding generations, is a big ask. Therefore, the Foundation is supporting court action to enforce a science-based reduction in emissions when there is still time to avoid a climate catastrophe. Legal Action to Require a National Climate Recovery Plan for Mitigating the Climate Crisis in Accordance with Science. The suit is known as Juliana v. United States. Kelsey Juliana submitted the suit along with 20 other youth represented by Foundation grantee, Our Children’s Trust. In 2016, U.S. District Judge Ann Aiken issued an historic opinion and order stating for the first time in U.S. jurisprudence that the U.S. Constitution protects the fundamental right to a climate system capable of sustaining human life. Quoting Judge Aiken: “Exercising my ‘reasoned judgment,’ I have no doubt that the right to a climate system capable of sustaining human life is fundamental to a free and ordered society.” As of Feb. 2019, the U.S. Court of Appeals has rejected four federal government attempts to avoid trial, and the U.S. Supreme court has rejected two similar government attempts; each time, both courts finding resoundingly in favor of the youth plaintiffs right to proceed to trial. Despite the current efforts of the Trump administration to prevent the case from being tried in court, the Foundation has continued to support Our Children’s Trust in enforcing the right to a stable climate. 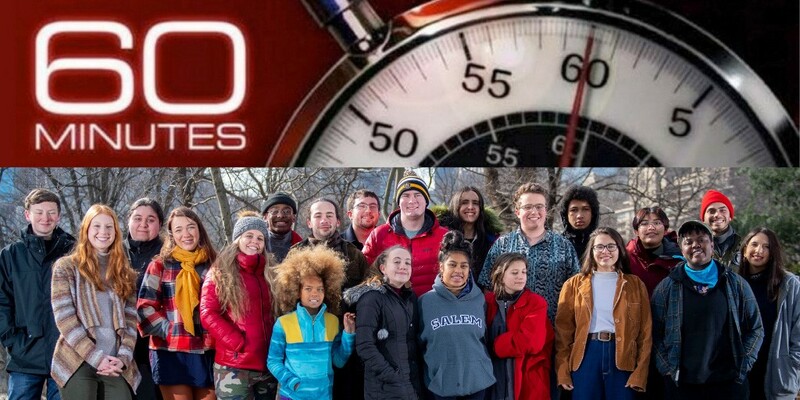 On March 2, 2019 60 Minutes aired a report on Juliana v. United States. 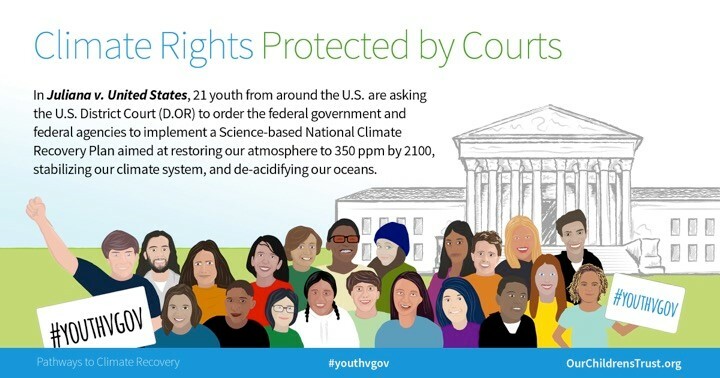 The Foundation is supporting Our Children’s Trust because this youth-led constitutional climate lawsuit has the potential to change the course of history. The suit is alerting the public to the fact that every president for the past 50 years has known that fossil fuels are causing global warming and that federal policy is promoting fossil fuel development, instead of clean-energy alternatives. A purpose of the Foundation is to address the underlying cause of economic imbalances. Thus far, most governmental action has been directed at short-term emergency relief for climate related damage such as storms and wildfires. Although states have been more active in reducing damage by building sea walls and restoring wetlands, their efforts will only provide temporary protection unless the cause of warming is addressed. 5 Rather than support short-term mitigation, the Foundation has long funded the development of market approaches for addressing the cause of climate change. Rather than pursue a strategy of sacrifice that implies a diminished or shrunken economy, the Foundation’s strategy is to pursue increased economic growth through increased productivity. Fossil fuels extraction damages the land, harms human health and imposes ever-increasing climate cost. All of these costs lower worker productivity. What must be sacrificed is continued production of fossil fuels at all costs. The “polluter pays” concept is the commonly accepted practice that those who produce pollution should bear the costs. In addition to harm to the climate, greenhouse gas emissions caused an estimated 12% of global deaths in 2012. The polluter pays principle can be applied to greenhouse gas emissions through a carbon price. 9 A shift to clean energy lessens insurance costs, improves the health of the land, lowers health costs, and increases worker productivity. One early series of Foundation grants supported research on taxing pollution as an efficient alternative to expensive regulation. The basic concept was to shift from taxing income to taxing pollution. An alternative strategy was to return income generated from a tax on pollution in the form of dividends to every citizen. A decade ago, as the risks of climate change became more evident, our funding shifted to research on taxing the carbon content of fuels at their source — where fossil fuels are distributed from the mine, the well, or the port of import. From an economic point of view, reducing pollution reduces waste. Although individual manufacturers benefit from disposing of waste gasses into the atmosphere, society as a whole is forced to pay for costs, including health effects, storm damages, droughts, an increase in fires, and sea level rise. Putting a price on pollution through a carbon tax incentivizes efficiency and rewards producers of clean energy. Although consumers will pay more for energy, a revenue-neutral carbon tax offsets other taxes, or returns the tax revenue to citizens as a dividend. Prior to the federal tax cuts of 2017 legislators had an opportunity to negotiate a grand bargain implementing a tax on carbon to address climate change, while directing the revenue to reduce taxes on personal and corporate income. Foundation-supported research pointed to a win for the economy and consumers, where taxes that discourage employment would be replaced by a simpler tax that discourages pollution. 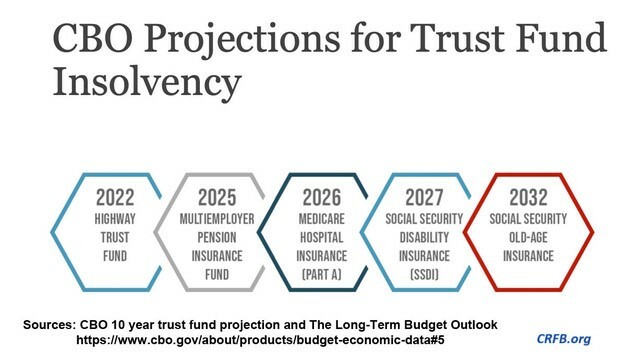 Instead, by passing a massive, unfunded tax cut, Congress increased the national debt, making it harder for government to fund other programs in the national interest, including climate change. With a shortfall in government funding, the public’s attention inevitably focuses more on urgent short-term problems rather than the growing costs of climate change. Today, economists are nearly unanimous in their support of a carbon tax as the most effective and least costly way to reduce carbon emissions causing climate change and ocean acidification. 10 Taxing the carbon content of fuels will raise the cost of goods manufactured using fossil fuels as a feedstock, or using fossil fuel energy. Taxing carbon gives manufactures an incentive to produce goods using clean energy. 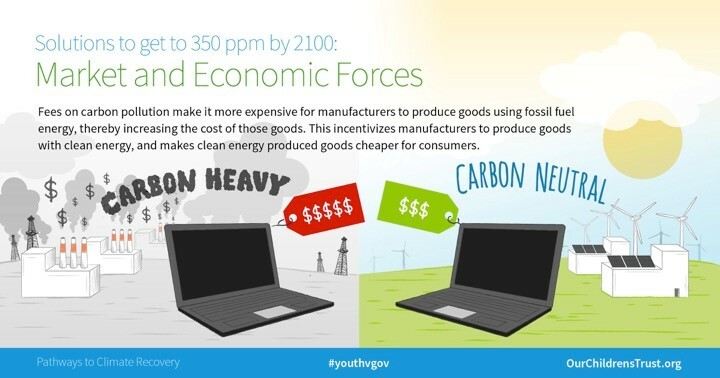 Price will then allow consumers to determine which goods are better for the environment because goods with a lower carbon footprint will be priced lower. Companies will also have an incentive to invest in clean energy and production. Pollution is a waste of raw materials. No one wants pollution. Reducing pollution by taxing it is one way to improve efficiency without increasing net cost. Furthermore, pollution taxes provide a funding source to offset the costs of adaptation and pay down more distortionary taxes. Rather than imposing inefficient and costly regualtions, pollution taxes allow producers and consumers to determine the least costly way to reduce environmental damage. A carbon tax will also be effective in addressing the growing waste crisis. Several years ago the Foundation began funding efforts to protect creatures used in medical research and ended up helping develop a solution to plastic waste. Here's how it happened. The Mount Dessert Biological Laboratory conducts medical research using marine creatures as subjects to better understand the causes, and develop treatments for human diseases. When the Foundation director visited the Lab, he discovered researchers were worried that marine creatures used as models for human disease were dying out. One cause was the loss of habitat, so the Foundation provided funding to recover sea grass beds where juvenile fish and shellfish lived. That led to the development of a web-based reporting tool enabling citizen-scientists to help the lab collect data reported via smartphones. Citizens began using the app to track plastic waste fouling the coast. Using data collected on the extent of plastic pollution, the South Carolina Aquarium worked with citizens using the app to change local ordinances and ban plastic bags in several coastal communities. In the water, plastic bags look like jellyfish that sea turtles eat. Plastic waste is killing turtles and other marine creatures. Banning plastic bags locally was a positive step, but the problem of plastic waste is so monumental that a more systemic solution is needed: one that makes recycling economical. The Foundation Trustees believe a carbon tax designed to address climate change, would also dramatically reduce plastic waste because it incentivizes recycling and efficient use of materials across the economy. An article in the business-oriented Wall Street Journal puts the problem in perspective. “In 1950, the world produced about 4 billion pounds of plastic a year. Today, we produce about 600 billion pounds. Every year, about 20 billion pounds of it ends up in the ocean. Over 90% of produced plastic has never been recycled, and it typically takes more than 400 years to break down naturally.” 11 The article points out that since China stopped taking much of our waste, cities have turned to disposing recyclable plastic in landfills. But with no financial incentive to recycle, much of the plastic ends up as litter. It’s washed down storm drains and ends up accumulating in the oceans. One untended consequence of fracking is the drop in price of “virgin resin”, the feedstock used to manufacture plastic. It is currently cheaper to manufacture new plastic resin from natural gas and oil, compared to recycling. Plastic resin can also be made from sustainably-produced plants, wood, and starch. 12 A carbon tax would make it more expensive for manufacturers to use fossil fuels as feedstocks, compared to sustainably-produced biological feedstocks and recycled material. A carbon tax will give manufacturers a strong incentive to collect, separate, and recycle plastic, glass, metals, and other materials. Once production from recycled feedstocks ramps up, economies of scale will drop the price of production and everyone will benefit, except fossil fuel producers. A carbon tax improves consumer choice by allowing polluting goods to be manufactured, but makes sustainably produced goods less expensive. Despite the strong economic logic of a carbon tax, legislators have failed to act. The Foundation continues to support a carbon tax, but also supports court action recognizing that politicians elected for relatively short terms have little incentive to address long-term problems, especially when most of the costs will be borne by today’s youth and future generations. As deficits continue to grow, a steadily rising carbon tax may become increasingly attractive as a way to fund revenue shortfalls. Wex Legal Dictionary, definition of public trust doctrine. Young People’s Burden: Requirement of Negative CO2 Emissions, by James Hansen, et. al., in Earth System Dynamics 8(3), Sept, 2016. U.N. chief calls for compromise, sacrifice at climate talks, Associated Press, Dec. 13, 2018. Why Should I Sacrifice When Big companies Are to Blame for Climate Change?, by Eve Andrews, Grist, Jan. 2, 2019. In Response to global warming, the idea of personal sacrifice resurfaces, by Dennis Sadowski, National Catholic Reporter, Nov. 30, 2018. What is the polluter pays principle? and, Why should the principle be applied to greenhouse gas emissions? The London School of Economics and Political Science, Grantham Research Institute, May 11, 2018. Help, We’re Drowning in Recycling!, by Christopher Mims, The Wall Street Journal, March 2, 2019. Sustainable Feedstock for Plastic Production, by Chris Walker, New Materials & Applications, March 30, 2017. Is the Public Willing to Pay to Help Fix Climate Change?, EPIC Energy Policy Institute at the University of Chicago, Jan. 2019.